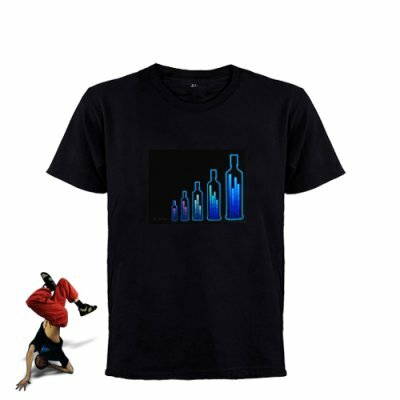 Successfully Added EL-Shirt - Sound Activated Light Shirt for Parties (Bottle-L) to your Shopping Cart. on 2010-10-04 02:18:27 I like the bottles most of all ! Just as I have seen the BOTTLES, I have made my mind that really belongs to me. So I have received the t-shirt. I love to wear it every time I make my evening constitutional the central street along. Many people have been stunned watching the playing bottles! on 2010-08-22 02:44:29 A perfect gift! Bought this one for my friend since he is a party person. The shirt looks just soo amazing and you get a lot of attention when wearing it. great thing for the price! I highly recommend it if you like parties and getting attention. the shirt is nice and attractive but i dont know the battery wont last long but i recommend this shirt to anybody is party attraction.